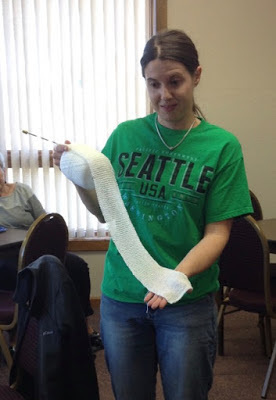 Rachel presented several crafting for charity options to Guild members at the October meeting. 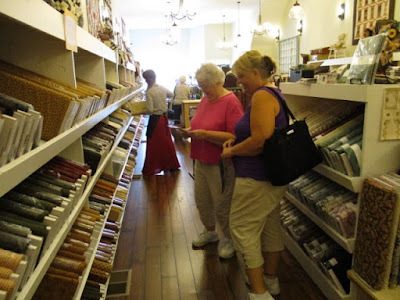 One project piqued my interest because I had a lot of crochet thread in my stash. The D.O.V.E. Fund has a Bandage Brigade for creating crocheted or knitted bandages for Vietnamese people suffering from leprosy. 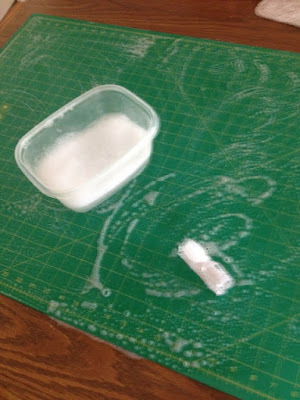 The bandages are created with white, cream, or ecru size 10 crochet cotton. 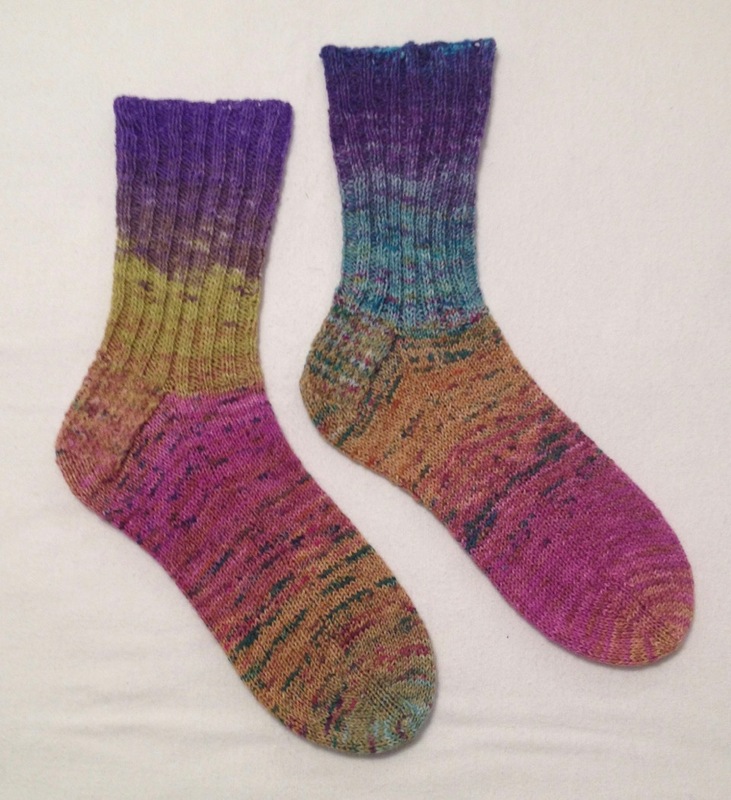 The knitted version is 28 stitches wide (approximately 4 inches) and 40 inches long - all garter stitch for easy knitting. I have one bandage finished and another one started. It's an easy project to work on in the evenings while "watching" television or a movie or while chatting at knitting night. 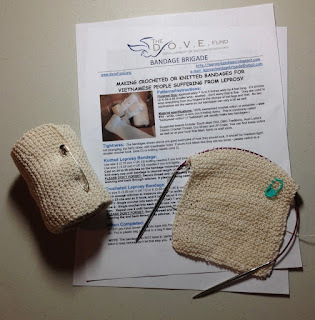 Information on the project and instructions for knitting or crocheting the bandages can be found here. 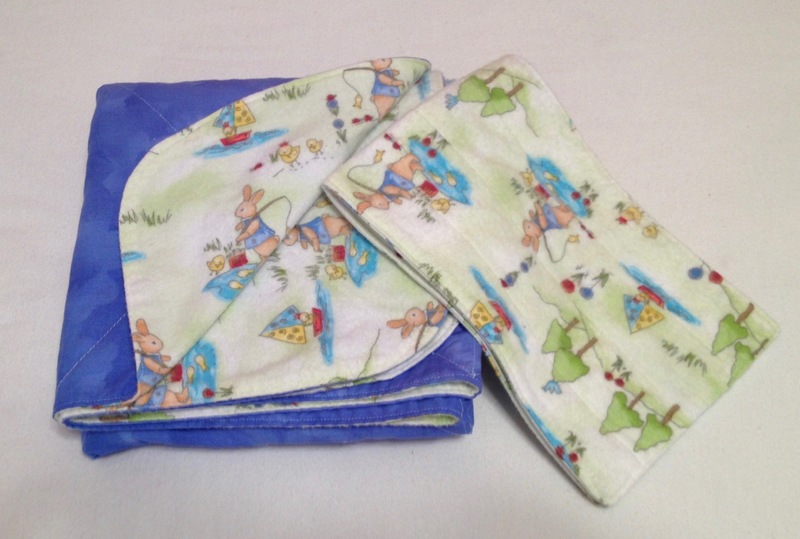 According to the website, the handmade bandages breathe well and can be sterilized for reuse. When finished, the bandages must be laundered, rolled, and secured with a large safety pin. I'll knit four or five before sending them to the Bandage Brigade headquarters. Won't you consider knitting or crocheting one or more of these much-needed bandages. I apologize if this photo has been shared before. 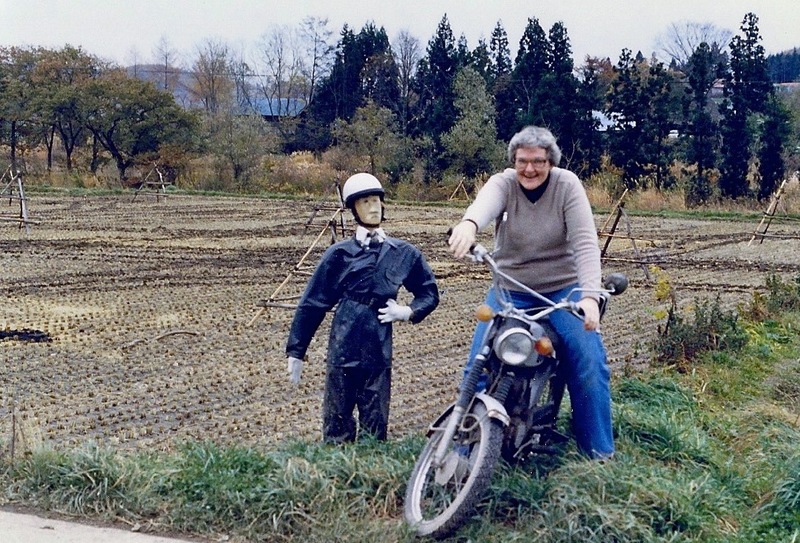 This old bike and policeman were placed on this rural road to slow traffic. If I remember correctly this was on the road to Lake Towada or near Towada City. Behind me is a harvested rice filed. Rice harvest photos can be seen on this post. Rice planting can be seen on this post. "Lord, I know it's not enough just to say the words thank you when a blessing, a kindness, or a gift comes my way. 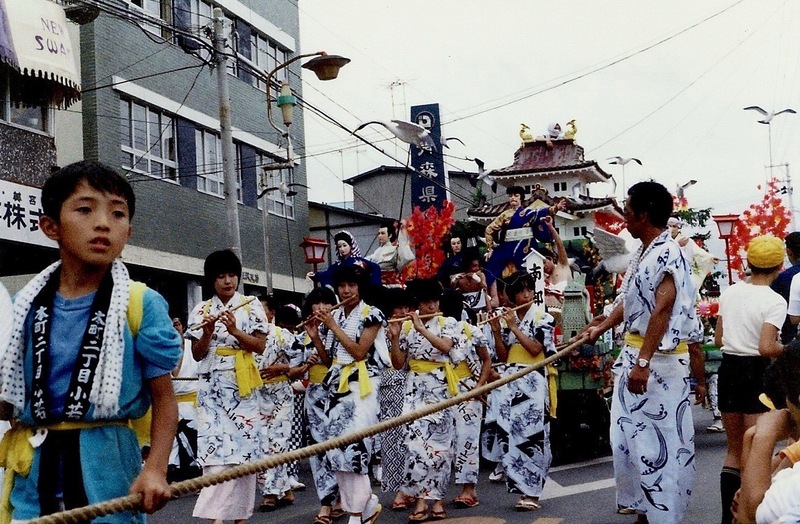 Verbalizing my thanks is a good start, but words are not the essence of gratitude. What I really desire, heavenly Father, is to have a grateful heart - a heart that so relishes love, mercy, grace, and all good things that it glows with appreciation long after receiving your many blessings. 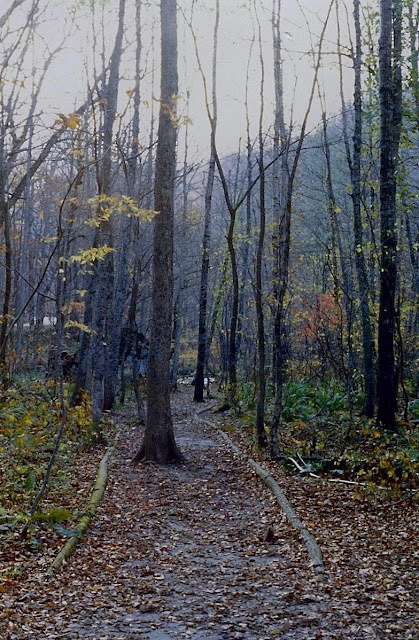 Teach me this kind of thankfulness, Lord, and let it inspire those around me to a deeper sense of gratitude as well." 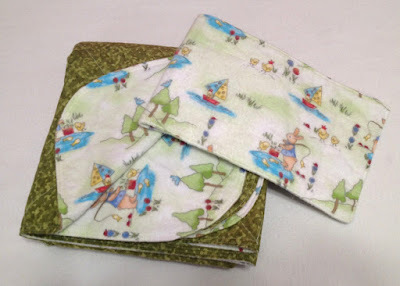 It's hard to resist a good deal, and when I saw this adorable fishing bunny fabric, I knew it would make some cute receiving blankets. I used a tone on tone fabric from my stash for the back, rounded the corners, did some cross-hatching to stabilize the two layers and called it good. The burp cloths were made from the remnants, so no scraps remain. These blankets will be donated to a local charity. It was fun to see the large mural on the side of the Retreat Center. 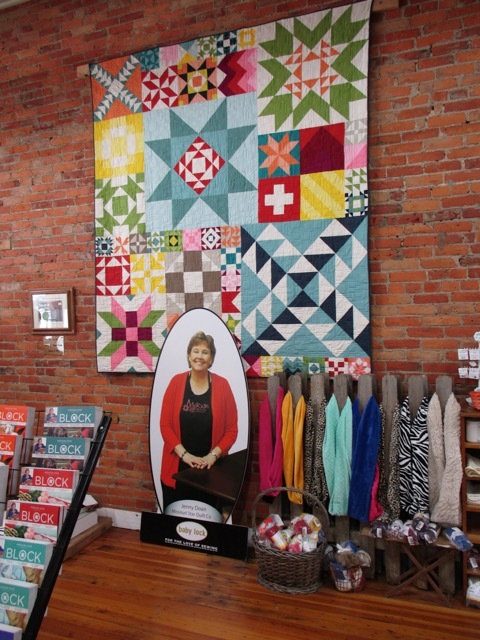 The quilt, shown above, features the signature block for the Missouri Star Quilt Company - the Missouri Star. 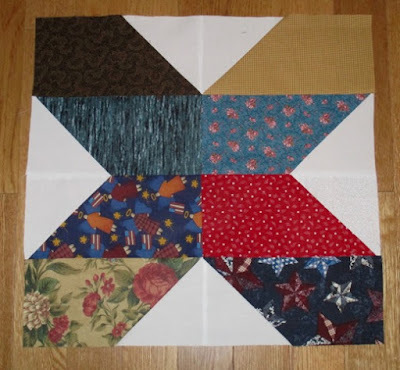 A tutorial on how to make the block and the quilt can be found here. I rarely sew with flannel, but when I saw a pile flannel squares at a thrift shop for less than a dollar, I could not resist purchasing them. The squares quickly came together in simple four-patch units. The blue and turquoise flannel was on clearance. 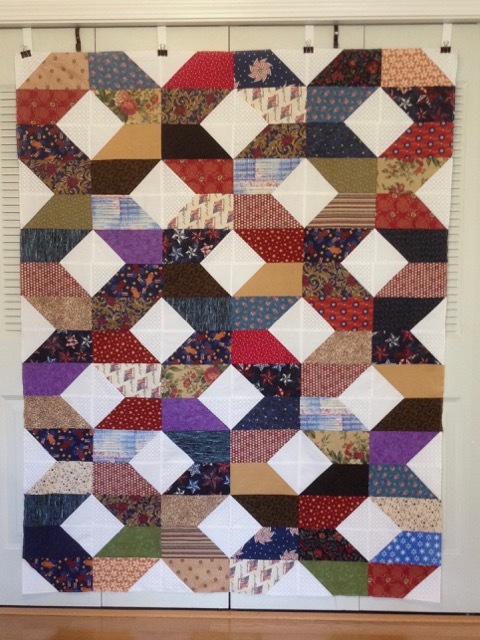 Sometimes the Quilts of Valor are returned to me from the longarm quilter with extra batting attached, and when I trim the quilts, I keep the batting pieces. 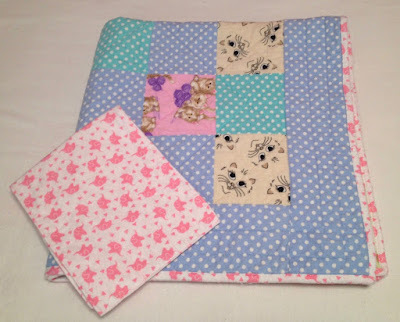 In this case it only took three pieces of scrap batting to cover the 40 inch square baby quilt. Some flannel remnants were used for the backing and binding. I did some simple cross-hatching to secure the quilt layers. The extra binding fabric was used to make a burp cloth. 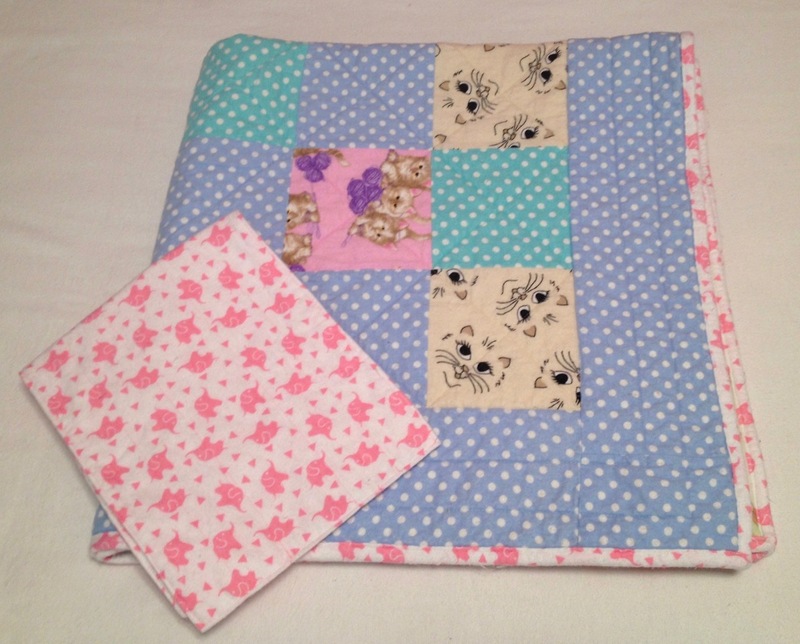 Blanket and burp cloth have been laundered and will be donated to a local charity. Trails in Japan work around nature and not against it. 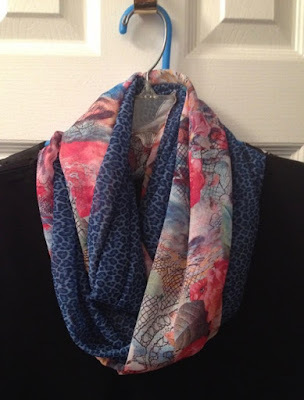 The selection of "scarf" fabric was very limited, but I found some that worked. The "jelly bean" fabric was found in the remnant bin. The teal/turquoise and white & black "netting" paired with solid jersey. Leopard-heart fabric was a bit stiff but was soften by the solid black jersey. 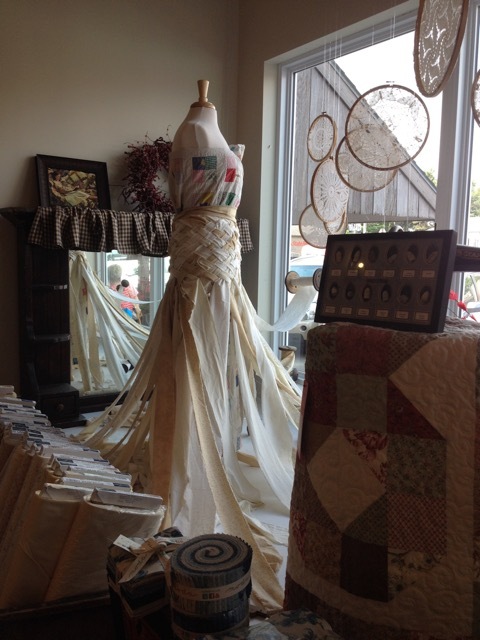 The scarves made with the netting fabric had the best drape, but it was somewhat of a challenge to sew. Thank you, Brenda H. for showing the Sistas how to make these scarves. It was recommended that the mat be flat, but my large mat did not fit in the tub, so I was cautious to keep both edges in the water and carefully removed the mat from the tepid water after about fifteen minutes. 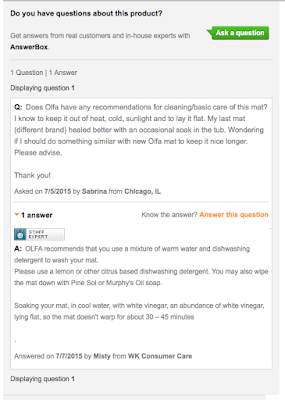 Once out of the tub, I gave the mat a good scrub with Murphy's Oil soap, as explained in the following response that I found on the OLFA site. My mat is now clean and a bit brighter. Is it like new? Of course not, but I didn't expect that. 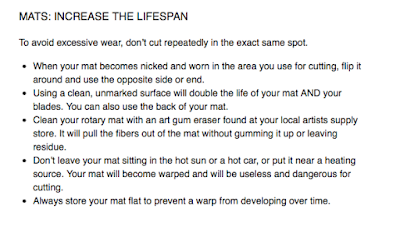 My mat does seem to have fewer sections that have deep grooves. Will I soak my mats again? Yes, probably a couple of times a year just for preventative maintenance, especially since I live in a dry climate. 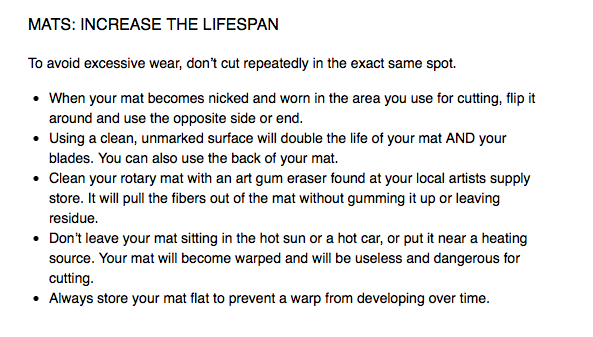 What maintenance do you do on your self-healing mats? Pattern: simple ribbed cuff and stockinette foot. From this September post, it looks like this project has been in the works for a long time. 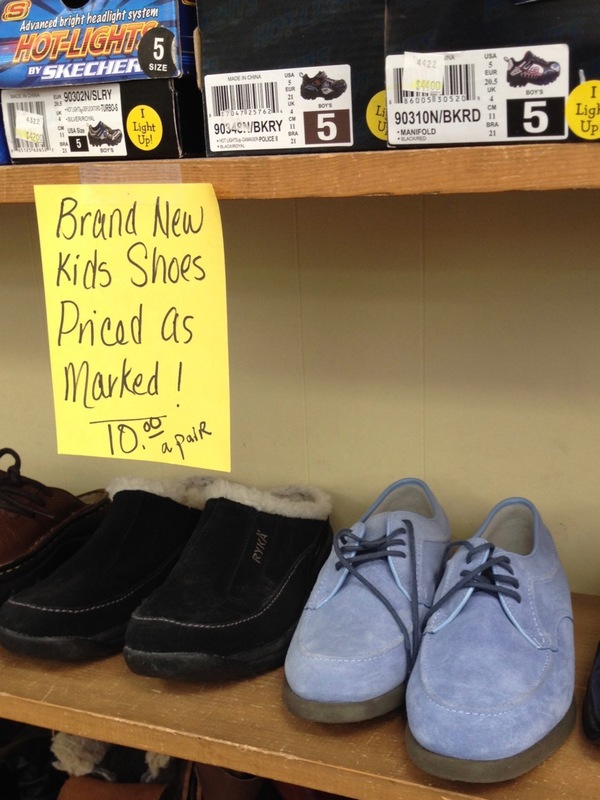 Look what I spied in Lander recently - Blue Suede Shoes! I nearly burst out in song. 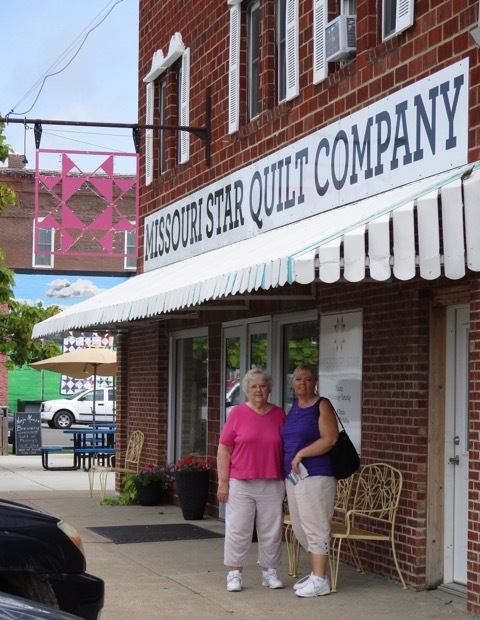 Brenda, Marilyn, and I saw numerous interesting and fun things on our August road trip across Kansas, but our primary destination was the Missouri Star Quilt Company (MSQC) in Hamilton, MO. 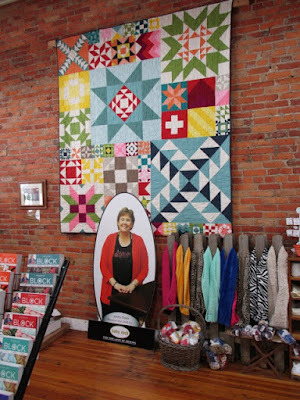 I would be willing to bet that eight out of ten quilters have seen at least one of Jenny Doan's many YouTube quilting videos. 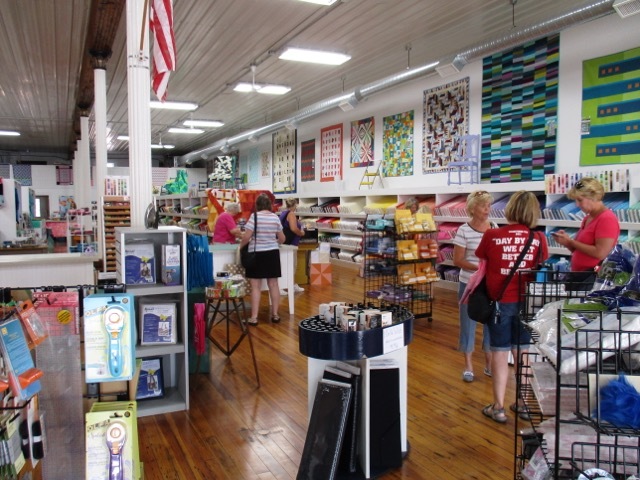 Jenny Doan and her family started with the original store (shown above) in 2008 and have since expanded the business by purchasing and refurbishing other old buildings in the small town. They have turned Hamilton, MO into a quilting mecca. Before the MSQC came to Hamilton, MO, these buildings were empty and crumbling. This block houses Sew Seasonal, Batik Boutique, Man's Land (being renovated & will be opened in 2016), MSQC Welcome Center, Licensed to Sew, Penney's Quilt Shop. 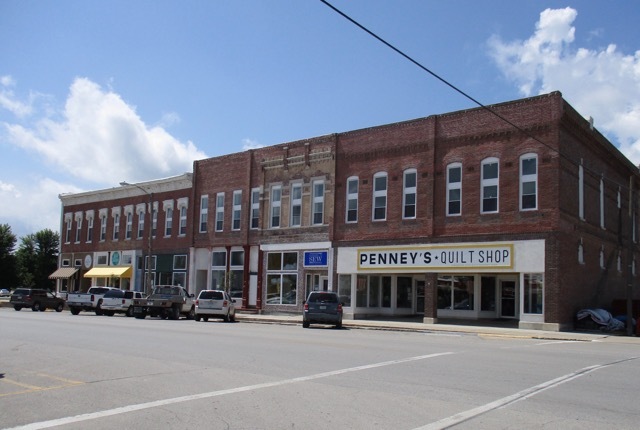 Across the street, other small businesses and restaurants were scattered among the MSQC shops. 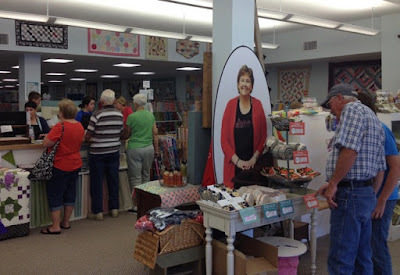 Seeing all of the fabric and quilts on display was nearly overwhelming. 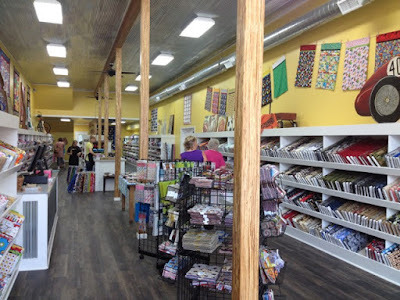 Brenda purchased several yards of Kansas Troubles fabric for a Jacob's Ladder quilt. 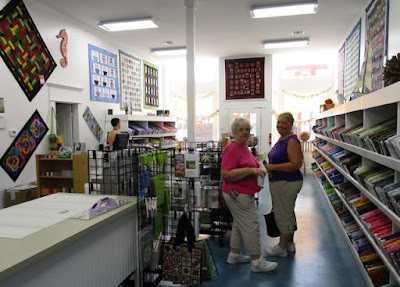 Marilyn said she would make the quilt if Brenda was our driver for the trip. MSQC also offers extended retreats for quilters, and the Sewing Center building has classroom space on the main floor and lodging upstairs. Sewing Center classroom space is well lit and open. 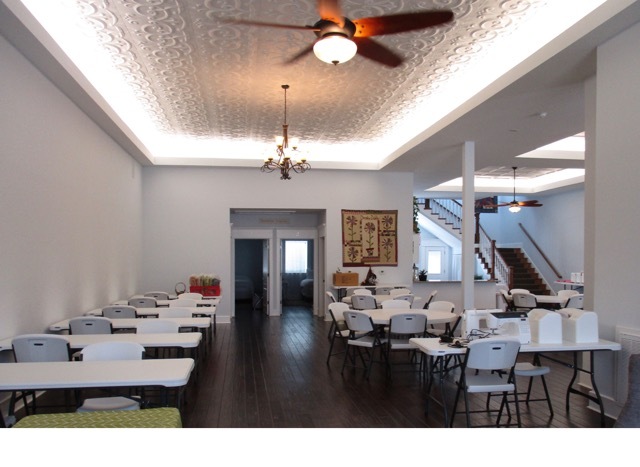 The open doors at the back of this photo are bedrooms for handicapped individuals. The staircase on the right leads to the dormitory rooms for retreat attendees. 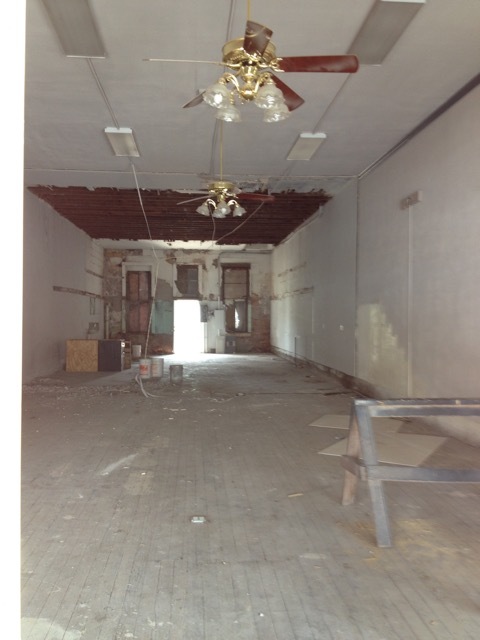 The MSQC continues to grow and will soon have a knitting shop. 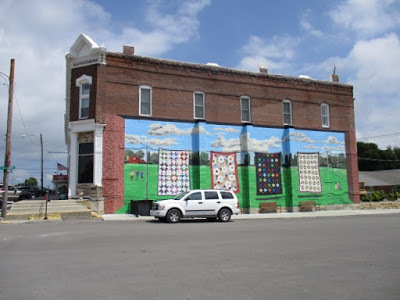 We ate lunch at a Subway next to the Penney's Quilt Shop, and as we were nearly finished eating, we noticed Jenny Doan sitting by the entrance visiting with a gentleman. Our trip to Hamilton and the MSQC was complete. Over the weekend, I worked on a stack of 10" squares from my scrap bins. 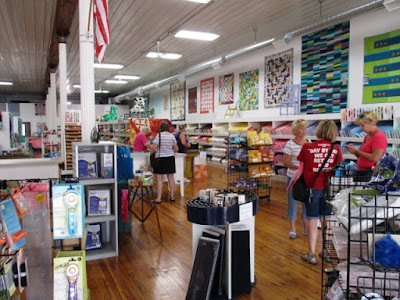 In quilting circles, this size is called a "layer cake." 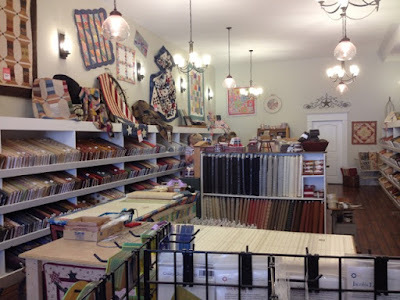 Quilt shops often sell various sizes of precuts of a complete line of fabric, and a "layer cake" bundle often contains 42 squares. 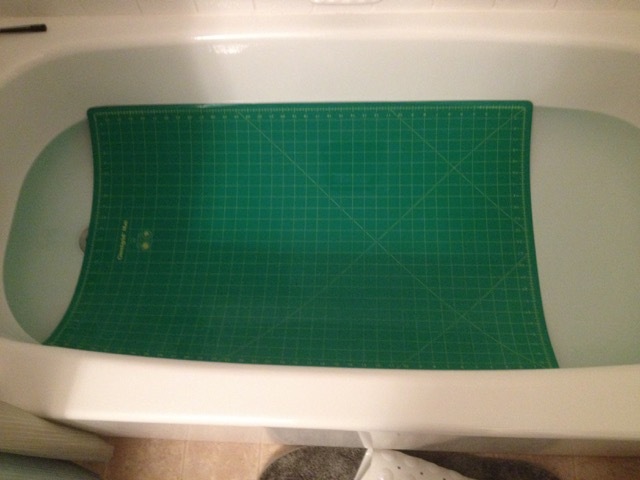 My squares were cut from the larger remnants of other quilting projects. The Roundabout blocks will finish 18 x 19, which is considerably larger than the blocks that I normally make for Quilts of Valor. 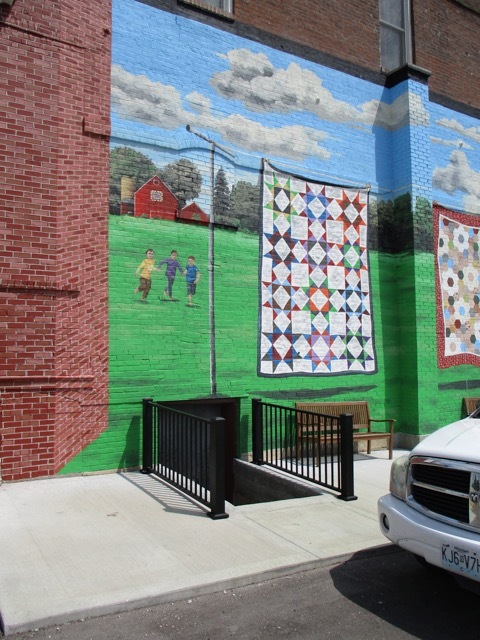 Because of the block size, this quilt will not have borders. The finished quilt top will be posted later this week.